The illegal cigarette trade shouldn't stop us from hiking tobacco taxes. Read why. Finance Minister Tito Mboweni has a tough job, and the nation will be reminded of this tonight as the minister makes his annual budget speech. Saving the country's embattled state-owned enterprises such as the national airline carrier and Eskom may be at the top of his list. But in an era of tight budgets and rising disease rates, Mboweni's speech should also focus on something else: Tobacco taxes. Under apartheid, the government had a cosy relationship with the tobacco industry and tobacco control policies were nearly non-existent, the authors of a 2003 World Bank book argue. But since the advent of democracy, the government has consistently increased excise taxes, on tobacco goods each year. Excise tax increases make smoking cigarettes less affordable and, as a result, smokers either cut down on consumption or stop altogether, the World Health Organisation (WHO) says. This makes them one of the most effective ways of cutting down tobacco use, the global body argues. Excise taxes also help offset the cost borne by the public health system when it's left footing the bill for the death and disease that comes with tobacco use. But the reality is that tobacco tax increases - particularly in the last six years - have been marginal. Between 2012 and 2017, National Treasury has only raised the excise taxes on cigarettes by between 58 and 82 cents a year, according to figures presented to Parliament. Last year's increase of R1.22 from R14.30 to R15.52 was the largest increase in seven years. But was this tax hike enough to get smokers to kick the habit? To find out and help inform public debate, The National Council Against Smoking asked the University of Cape Town's Economics of Tobacco Control Project to model the impact of different levels of increases. Researchers at the unit plugged historical information on cigarette tax rates and consumption into a series of mathematical equations and algorithms to create a model that would help simulate, on paper, how people would respond to the increase in the price of their daily tobacco fix. The model made some key assumptions, including that tobacco companies wouldn't adjust their prices to compensate for higher taxes. The analysis also assumed that about half of any reduction following tax hikes would be because smokers didn't just reduce how much they smoked but because they stopped completely, as suggested by International Agency for Research on Cancer's 2011 handbook. We found that Treasury's 2017 cigarette excise tax hike meant that South Africans would have smoked 12.2 million fewer boxes of cigarettes than in 2017. The increase was estimated to bring in an extra R103.4-million into the state's coffers, compared to what it earned from the same tax in 2017. The tax increase still meant that people who smoked an average of nine cigarettes a day would only have spent about R200-00 a year on cigarettes - too little to change behaviour significantly, according to the modelling experiment. The analysis made an attempt to include cigarettes sold illicitly, which our recent studies currently in publication estimate to be about 30% of the total market. How much is too much for a fix? Finding out just how much South Africans are willing to pay for cigarettes is key to winning the country's war on the death and disease that come with tobacco use. Now, new models are getting us closer to the answer. This year, South Africans have once again taken to social media offering their "Tips for Tito" ahead of the budget speech. Here's ours: If Mboweni repeats his predecessor's decisions to increase the tobacco tax by only 3% above inflation, as he did last year, our simulations say that it will earn the state R178-million. But it won't be enough to get a significant number of South Africans to cut back on smoking. In fact, it would only reduce cigarette consumption by 8.4-million packs, according to our analysis. Our tip for Tito? Raise excise taxes on cigarettes by at least 8% above inflation per year for the next four years. Assuming inflation remains at 5% per annum, an increase of 8% above inflation would raise the excise tax to R25.66 by 2022. If the average price of a box of cigarettes is currently R34.29, this increase would mean smokers would on average pay about R37.81 per box after the first increase, and by year four, they would fork out on average R51.09 per box. By the end of four years, the country would smoke about 90-million fewer cigarette packs than they do today. And within four years, this tax increase would mean an astounding R17.1-billion collected for the National Treasury, compared to the current R11.8-billion. But will Tito take on Big Tobacco? The tobacco industry continues to argue that increasing excise taxes will buoy the illicit trade, causing more people to look for cheaper alternatives to legal brands. The illicit cigarette trade in South Africa and the region is a criminal and illegal one that requires stringent enforcement and action from the criminal justice sector. It cannot be used to hold back effective public health policies that will both improve the quality of life for South Africans and reduce the burden on an already overstretched public health system; the onus is on the South African Revenue Service and the criminal justice system to enforce the tax and put crooks behind bars. Almost 60% of all deaths in South Africa were attributed to non-communicable diseases (NCD) in 2016, including those linked to tobacco use such as cancer and cardiovascular disease, Statistics South Africa data shows. South Africa has an obligation to meet the nine voluntary WHO targets on global non-communicable diseases, including mental health, it has signed onto. For these goals to be met by 2025, it must - for instance - reduce deaths due to cancer and chronic respiratory diseases by 25% as compared to 2010 levels. For the country to meet targets and for these deaths to be averted, the government will have to put various tobacco control interventions in place. But these deaths are not just about lives lost. 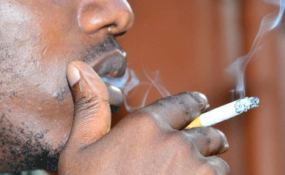 Smoking costs South Africa an estimated R59-billion annually in healthcare costs but also in lost productivity in terms of sickness and death, the American Cancer Society's annual Tobacco Atlas reports. The Draft Tobacco Control Bill is expected to go before the new Parliament later this year and hopes to change this by, for instance, introducing 100% smoke-free indoor public spaces, regulating e-cigarettes and introducing the plain packaging of cigarette packs. However, that is not enough. The only way to ensure that taxpayers do not subsidise tobacco-related harm is to substantially increase the tobacco excise taxes. This will offset the cost to the public health system and the burden for the harm will be paid for by the smoker and the tobacco industry. In addition to these economic benefits, excise tax increases will also reduce the number of smokers, creating a virtuous cycle of reduced public health costs and increasing tax income. Savera Kalideen is the executive director of the National Council Against Smoking. Follow her on Twitter at @SAQuitline. Kirsten van der Zee is a research officer at UCT's Economics of Tobacco Control Project. Follow the unit at @Tobaccoecon or get in touch with them via email to find out more about its latest taxation simulations and data.